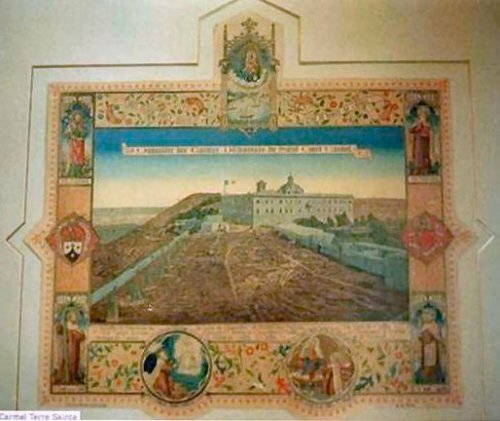 The best known monastery of the Carmelite Friars in Israel is that of Stella Maris on Mount Carmel. Its name, which means Star of the Sea, has its origin from the lighthouse built by the Friars in 1864, just across the road from the Carmelite Basilica. Around 1955, the name was extended to all the property of the Friars. Nowadays, in order to get there it suffices to say to the taxi driver just “Stella Maris”, and he will take you right there. Also, Stella Maris Street appears on all the maps. The monastery is about 4 km. from the site of the cradle of the Order: Wadi ’Ayin es Siah, where the first Carmelite friars established themselves at the end of the 12th century. Today, the city of Haifa surrounds the monastery. The basilica is also visited by pilgrims, Jews, Muslims and Christians, who come “to pay a visit” to Elijah the prophet in his “grotto” situated under the sanctuary of the church. A community of Carmelite Friars lives in Stella Maris and receives the pilgrims. These Carmelites, like their predecessors, are of many nationalities, and moreover speak many languages. This is most useful for giving explanations or advice to those who ask. A pilgrim centre, recently renovated, provides accommodation for those who desire to remain some days there. It is run by the Carmelite Sisters of St Teresa of Florence. Small walks have been provided in the property and pilgrims can make the Stations of the Cross in the garden as well as pray in the Basilica, before the famous statue of Our Lady of Mount Carmel.